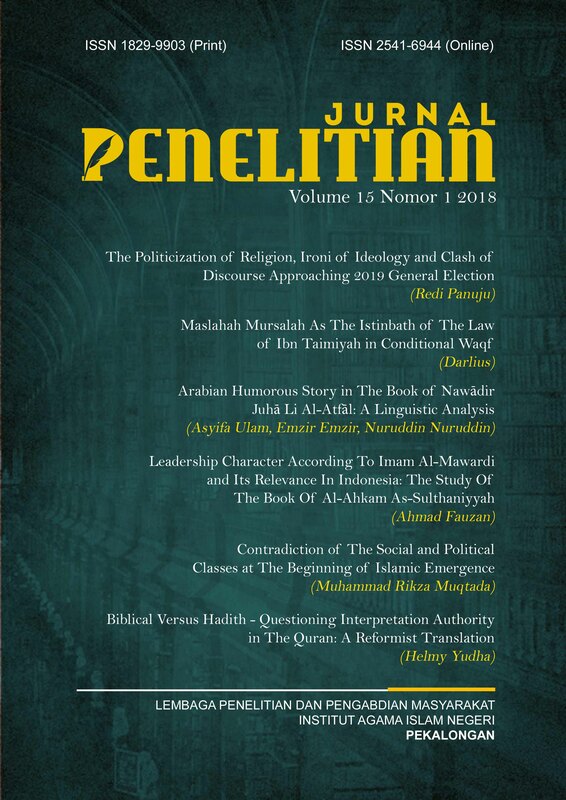 Jurnal Penelitian (ISSN: 1829-9903 and -ISSN: 2541-6944) is a peer-reviewed journal published twice a year by Institute for Research and Community Services (LP2M), The State Islamic Institute (IAIN) Pekalongan, Central Java, Indonesia. This journal is a religious or Islamic studies journal containing (library or field) research results from various aspects of discipline, religion, social, education, law, economy, politics, environment, language, art and culture. We warmly welcome contributions from scholars and researchers of many disciplines. All submitted manuscripts are subject to double-blind review process. This journal is an open access journal. Users are allowed to read, download, copy, distribute, print, search, or link to the full texts of the articles, or use them for any other lawful purpose, without asking prior permission from the publisher or the author. Jurnal Penelitian has been accredited grade 3 (Sinta 3) by The Ministry of Research, Technology, and Higher Education, Republic of Indonesia as an academic journal (SK NOMOR 21/E/KPT/2018, No. 103). Jurnal Penelitian has become a CrossRef Member since the year 2017. Therefore, all articles published by Jurnal Penelitian will have unique DOI number.